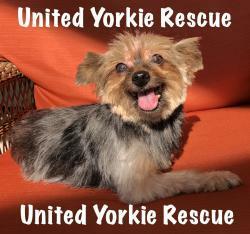 At United Yorkie Rescue we are blessed with an extraordinary success rate in finding forever homes for our rescued foster dogs. To share this joy we’ve created this “Happy Tails” page. Happy Tails is devoted to the celebration of these wonderful stories with everyone who loves dogs. We hope that you enjoy these "Tails" as much as we have. Thank you!! 1-9-19 Kiya was adopted today. Sweet Kiya was adopted by a wonderful mommy today. All she wants to do is be near her human. She now lives with her new mom in and will have all the human time she desires. It will be just Kiya and her mommy forever So happy for Kiya. She got her happily ever after. 12-26-18 Hooray and Happy Holiday Sophie was adopted today! Sweet little 4 pound, 8 year old Sophie went to her forever home today. 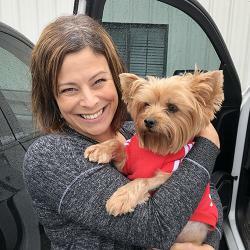 Sophie came to United Yorkie Rescue when her family realized leaving a little dog in a crate all day for sometimes up to 13 hours, was just not fair to her. With lots of tears Sophie became a UYR pup. She did great in her foster home, only she didn't like not being able to get more attention. Sophie's new mom and dad work from home and Sophie will never be alone again. She has only one fur sister just about her age and size who has already given Sophie lots of kisses and love. Sophie felt right at home in her new home and even fell asleep in her new daddy's arms. We are so happy for Sophie. She found her forever home and is home for the holidays. 12/23/18 Brinkley was adopted today and he couldn't be happier. Brinkley was with his first family most of his life and at 10 years old he found that he needed a new family. One of the children in his first family became severely allergic to him. Rare as it is, the doctor said it does sometimes happen. 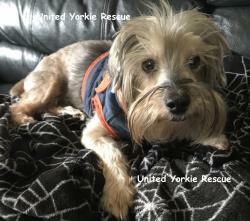 The family tried everything, but their little boy wasn't getting better and so Brinkley became a United Yorkie Rescue dog. Besides for have a heart murmur which doesn't effect him at all, he is about as perfect a dog as you could want. And his new family who adopted him today knew it. It was love at first sight for them and for Brinkley. Brinkley will be their only dog and the light of their life. He has a fenced yard which he will love because he likes to run around. 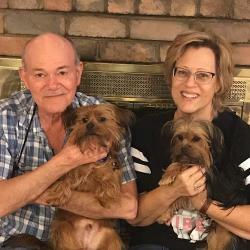 Brinkley found his perfect forever home and his new mom and dad found their perfect forever pup. Happy Tails to everyone. Brinkley is home for the holidays forever. I love my new daddy. 12/15/2018: Hi, It's me, Star. I am here to give you my happy news. I got adopted today and will be moving to South Carolina. In the beginning I did not like my insulin injection. It was one of the reasons my first family had to surrender me. They couldn't help me with my diabetes since I didn't let them give me my insulin injections. At first I fought Foster Mom every time I needed my shot. My Foster Mom has helped me to learn that the shots don’t hurt and she was right. My diabetes is getting better, but I will need a few more of those tests with the vet. Foster Mom has also taught me manners so I can be a good girl with my new family. I now walk on a leash like a good girl without pulling. I also learned about being free in a fenced yard. I am excited to go to a family that has experience with doggie diabetes and has other dogs for me to play with. Thank you UYR for helping me prepare for my fur-ever home and family. I am Princess. I have a forever home fit for a princess. 12-8-18 Princess was adopted today. Who would have thought that this sweet little girl would have gone from what we thought was terminal cancer, to a full recovery, to her forever home. Princess came into UYR almost a year ago. She was diagnosed with a cancerous lump in her rear leg. Even the specialist said it was cancer and she wouldn't have long to live. Determined not to give up her foster mom wanted a biopsy done. Princess when to a vet who took out as much of the mass as possible and sent it off. Unfortunately they said the mass was dead tissues and they couldn't tell if it was malignant or benign. Princess was not quite 9 years old, and still her foster mom was not ready to give up on her. So watching the mass for several months she said it wasn't growing and maybe it was all removed during the biopsy surgery. At that time we decided to take a chance and remove the whole leg. So back to surgery Princess went and off came that leg that she hardly used anyway. The surgeon believed she got the whole mass when the leg was removed, but sent the leg off to the lab to be sure. We all hoped for a good report. Sure enough there were clear margins and hooray, hooray the cancer was gone and Princess was ready to find her forever home. She was almost ready for adoption when she started to have seizures. Princess was put on seizure meds and after a month it was decided the meds were working and she could be adopted. Today Princess when to her wonderful forever home. Her new mom knows all about seizures, just in case. 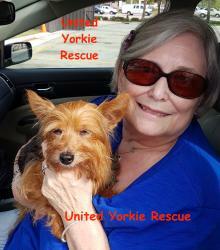 Princess has a fur sister to play with who was also adopted from United Yorkie Rescue. There is also a nice fenced yard and someone home all the time to be with the pups. Princess was one amazing story. From being considered terminal to finding a wonderful forever home. Her foster mom never ever gave up on her, and Princess truly had her fairy tale ending. Live Happily Ever After, Princess. You deserve this. 12/07/18. Bruno has found his forever home! 12/7/18 Today Rufus found his happy forever family and he must be the luckiest dog on earth. He found a forever home with lots of fur friends to play with and one strange creature that he wants to like, but needs to get to know. Rufus will be sharing his adoptive family with a 13 year old Standard Poodle, a 1 year old Greyhound mix, two cats, and a Potbelly Pig. Rufus and the pig are about the same size and seem to have a liking for each other, but both want to know more before fully committing. There are also some horses and a mini donkey in the back pasture that he will surely meet someday. His adoptive parents are just the kindest folks with three sweet and adorable children. Rufus has immediately taken to all of them. 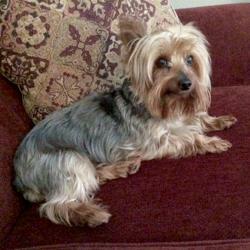 He will be enjoying the rest of his like with a super loving family, some fur friends, and enjoying the country life. What more could a Yorkie ask for. I have a new mom and dad. Hooray for me. 12-5-18 Darling little Dante was adopted today. From a home with his owners, to another home when his owners left the country, to the shelter when the other people couldn't care for him, to a foster home, and then finally to a real forever and ever home. That's a lot for a little guy in less than 2 months. Poor Dante was so confused and sad. He had to wait in the shelter for almost a week while they made sure his owners weren't coming for him. 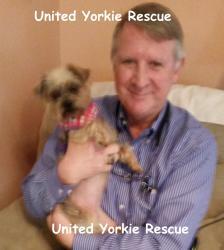 When finally United Yorkie Rescue got this tiny little 4.5-pound baby he knew his life just got better. Dante was in pretty rough shape. He needed a neuter and a dental. His dental disease was so bad he lost all his teeth, but that didn't stop Dante from being the most loving little guy. He loves people so much—his foster parents knew he needed a home with someone there most of the day, someone who would love him and let him be their forever baby. Today that happened. He has a wonderful stay at home mom and dad. He will be the only pup in their lives and get all the love and attention. Dante knows his life just became the best he could ever have hoped for. We are so happy for Dante. We love a story with a happy ending and this was the happiest. 11-29-18 Golly G (Gee) was adopted today. This adorable 10.5 year old pup found his perfect forever home today. 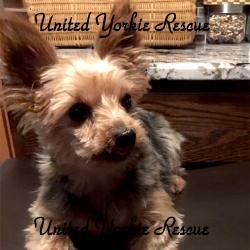 Gee came into United Yorkie Rescue with his 3 friends. They all needed a lot of vet care and a grooming. Gee had infections in his eyes and ears, and blood work showing he had an under active thyroid. It took good nutrition and a lot of care but finally Gee was healthy. Even his thyroid levels were back to normal. When he first arrived at his foster home he was pretty sad. He missed his brothers and sister and just wasn't sure about all this newness. It took a while but with lots of love and patience Gee learned that it was okay to trust people and love them. After being in his foster home for a month and a day he went to his new home in the arms of his loving new mom. Gee is going to have a wonderful life. His new mommy told him she has been waiting a long time for him and what a wonderful life he was going to have with her. Gee's foster parents are going to miss him, but are so happy for the great future that lies ahead for this sweet boy. Happy Tails sweet Gee. I have a new forever mommy. 11-27-18 Little Isabella was adopted today. Sweet Isabella went to her forever home today. 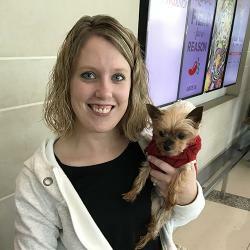 Tiny 4.5 pound Izzy came to us with 3 others dogs. They all needed vet care and grooming and lots of love. It took a while for Izzy to settle in because she missed her brothers. But her foster mommy helped her so much to know she was okay and loved and her life would be soon filled with joy and happiness. Today Isabella, at the age of 13, found her last and final forever home. And it came true--her life is filled with so much joy and happiness and love. Isabella is ready for the rest of her wonderful life to begin. 11-25-18 Stitch was adopted today. This little boy was in rough shape when he came to UYR. A good samaritan found him on the streets and took him to the local animal control. When no one claimed him the good samaritan did and surrendered him to UYR. Stitch has gone through an amazing transformation, from being scruffy, flea ridden, and underweight to a handsome boy. He will be so pampered in his new furever home. His new mom and dad are retired and will cater to his every need and desire. His new fur sister, Zoey, welcomed him with open paws. He'll have home cooked meals and more love than he's ever had in his previous life. Many walks, car rides, and belly rubs are in Stitch's future. Well done, Stitch. 11-25-18 Itsey found her perfect forever family today. 11/23/18 Little Ms. Ella has found her forever home! 11-19-18: Love came in a package of 2 for Jennifer!! 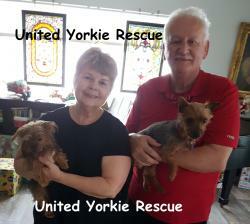 UNITED YORKIE RESCUE sweet Buttons and Jackson will have the most amazing life together. Thank you for loving these special needs babies and caring enough to give them both the best future forever! !